Learn the basics to master the road. More than 200 different materials are used to build a tire. However, the main components of a tire are natural rubber, synthetic rubber, steel, fabric materials and carbon black. Many different compounds can be present in one tire, because different parts of the tire perform different tasks. 1) Decide on the correct use for your tire. Make your selection from among the ranges of MICHELIN tires. Each range corresponds to different requirements and conditions of use for hauliers (long haul, urban, off-road…). 2) Decide on the right size of tire The maximum load for an axle is given by the vehicle manufacturer depending on current regulations. Simply fitting tires that can bear a greater load to an axle does not mean it is possible to take on loads greater than those approved by the manufacturer. There are wheels that correspond to each size of truck tire or tires (width of rim): consult the ETRTO Standards Manual and/or the manufacturer's recommendations. Never fit a tire to an unapproved rim: there is a risk of damage to the wheel and/or tire, insufficient contact patch, over working of the tire casing, grip and longevity can also be affected. 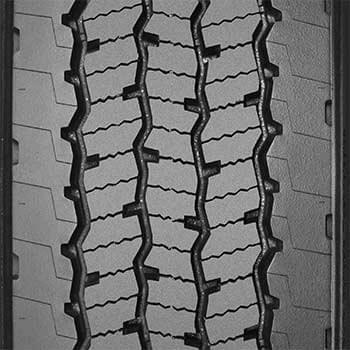 3) Choosing the right tread pattern. 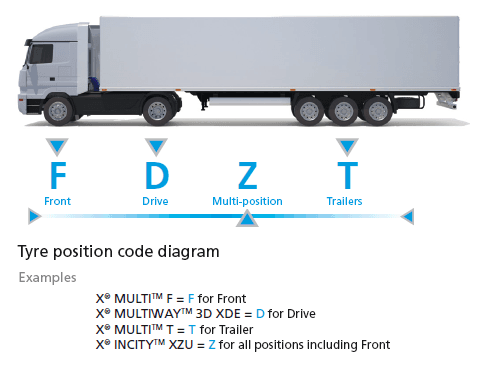 Follow the criteria for choosing the tread pattern of truck tires according to the position of the axle on the vehicle: F for Front Axle, D for Drive Axle, T for Trailer Axle, Z for all positions. There is much more to a tire’s sidewall than the tire size. In fact, there can be as much as 25 different icons and descriptions. Learn how to read them, what they mean, and how you can choose the perfect tire for you. Michelin uses specific names, numbers or letters to identify applications, tread patterns, casing construction or benefits. And beginning in 2012, Michelin started updating its commercial truck tire names and sidewall markings to make their usage better understood by our customers. 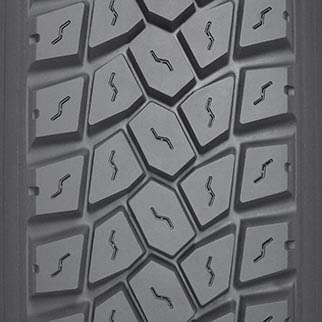 The new names such as MICHELIN® X® MULTI™, X® LINE™ and X® WORKS™ are easily visible on the sidewall. Characterization: Grooves placed parallel to the bead, thus forming ribs, ranging in tread depths from 11/32nds to 23/32nds.Benefits: Usually significantly better for fuel economy, although does not provide enhanced wet or snow traction.Position: Usually found on the steering axle of a truck/tractor and on other free rolling axles such as trailers, dollies, tag and pusher axles. Also found on torque axles when traction is not a high priority. The key to getting the most out of your tire assets is proper maintenance. Constant care will keep your tires rolling longer. If you follow our basic steps to tire maintenance, your tires can deliver maximum mileage, wear and safety for your trucks. Many of today's tire problems are caused by insufficient or careless attention to tire pressures. No tire or tube is completely impervious to loss of air pressure. To determine the proper inflation pressure, all trucks should be weighed. Be sure to weigh your vehicles, fully loaded, on a scale. Each axle, front and rear, and trailer must be weighed separately. Actual gross axle weights should be compared with the manufacturer's tire data book to determine the inflation pressure required. The load carried by each individual front axle tire should be noted. If the maximum load-carrying capacity of the tire is below the actual scale weight, greater carrying capacity tires must be used, either a higher load index (load range or ply rating) or a larger tire size. Under-inflation will increase the deflection of the sidewalls. The effect of over-flexing and the generation of too much heat will cause carcass fatigue and deterioration. The tire carcass becomes more susceptible to damage in the form of shocks and rapid tread wear. Tire wear is the result of friction between the road and your tire as it rolls. And friction is based upon many different properties, including the tire's rubber, the tire's load and inflation and the influence of the mechanical system (such as alignment and road surface).To achieve optimized tire wear, the tire should be properly aligned, properly inflated and carry the proper load weight. It would create a well-worn footprint and its weight would be evenly distributed over the footprint to maximize the tire's tread life. But this is the real world. Watch the video below to learn the fundamentals of tire wear, and discover how tire alignment affects your tire's wear. Pre-trip inspections increase safety and maximize uptime. Not to mention they are a regulatory requirement. Make sure you own a calibrated air gauge, and then follow the steps below. We've also created two videos to help get you started. 1. Check your tires for proper inflation. If a tire is 20% below its targeted PSI, it is considered flat and should be replaced. Also, dual tires should be within 10 PSIs of each other. 2. Check your valve caps to make sure they are properly secured. 3. Look for tread wear and check proper tread depth. To learn the fundamentals of tire wear. 4. Check for tire cuts or bulges in the sidewall. 5. Check wheel and lug nut conditions. Make sure there is no rust or bends.